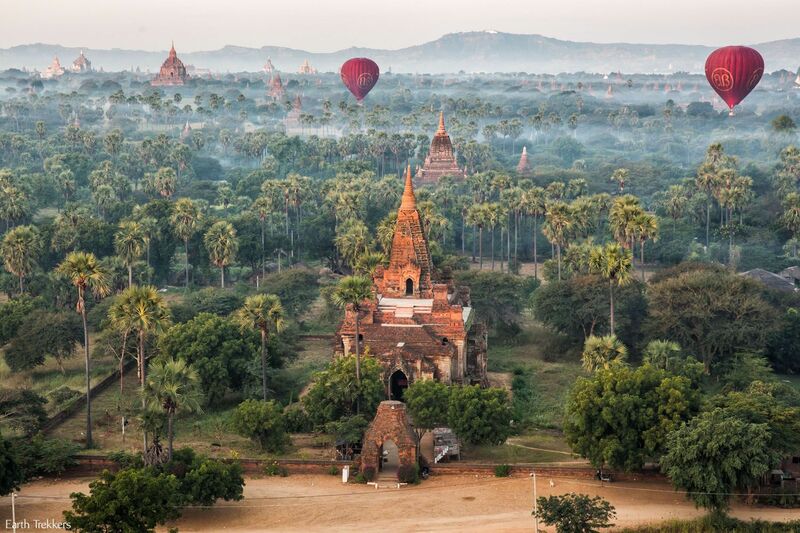 Bagan, Myanmar…a mystical land of temples in a tropical, misty landscape. 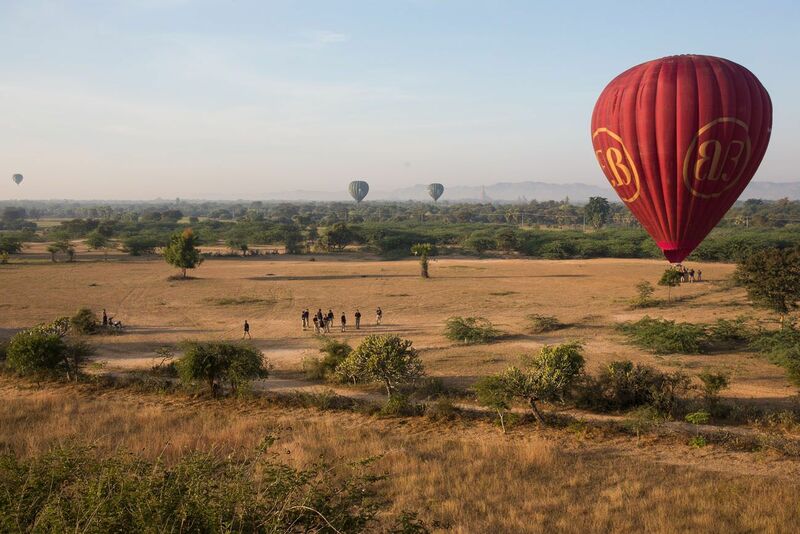 The best way to see Bagan is by sunrise hot air balloon, a big splurge on our round the world budget, but very much worth it for these bird’s eye views over this beautiful place. Our morning started before sunrise, when we were picked up from our hotel. 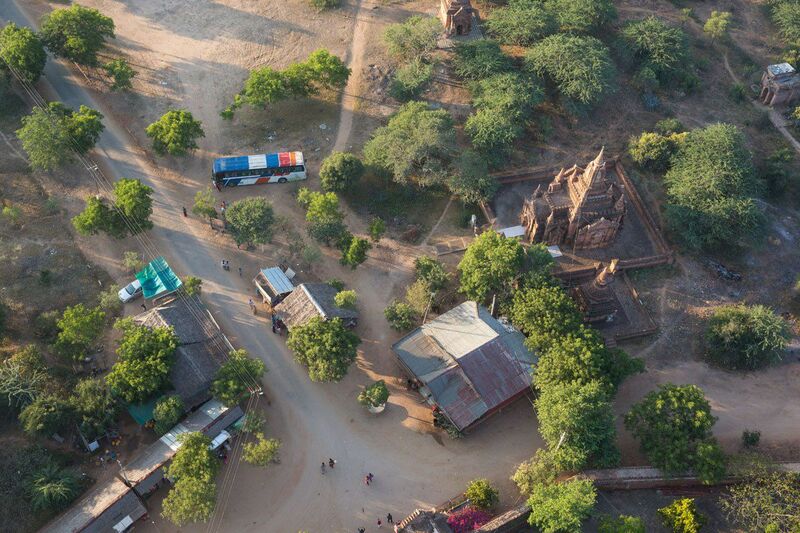 By antique bus we were driven to the take off point, a field located just outside of Old Bagan. 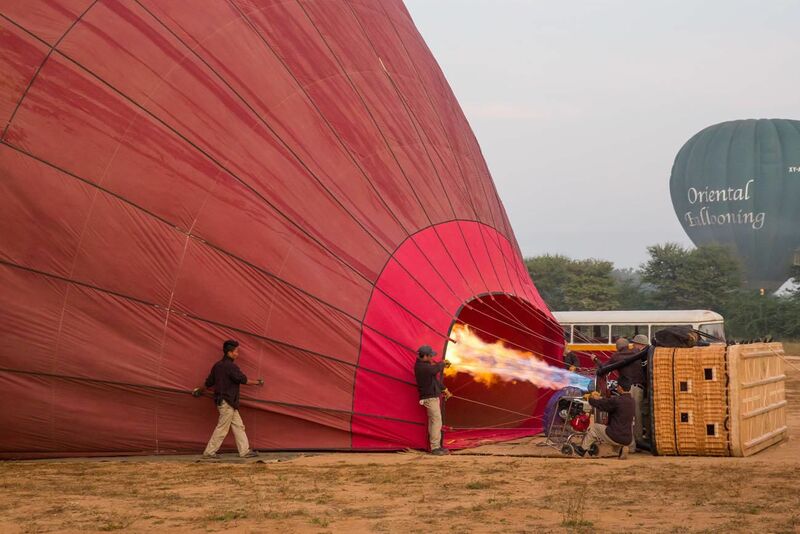 We had coffee and cookies and watched as about ten balloons were inflated with air and then heated by the balloon’s furnace. As the sun rose, our balloon soundlessly lifted off of the ground. Our journey had begun. A morning mist covered the ground, making the landscape look magical. 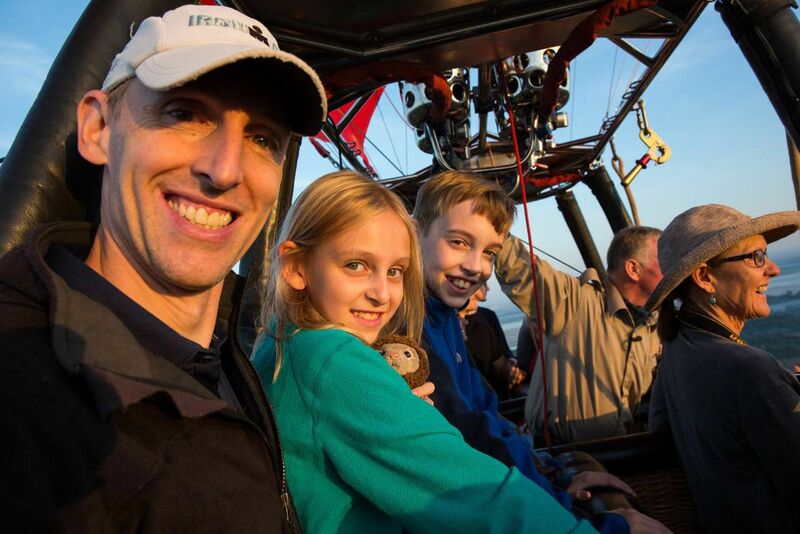 This was the second balloon ride for our family. Our first took place in Cappadocia, Turkey two years ago. This was also an incredible experience. Cappadocia has a very unique landscape and this was another great place to tour by hot air balloon. 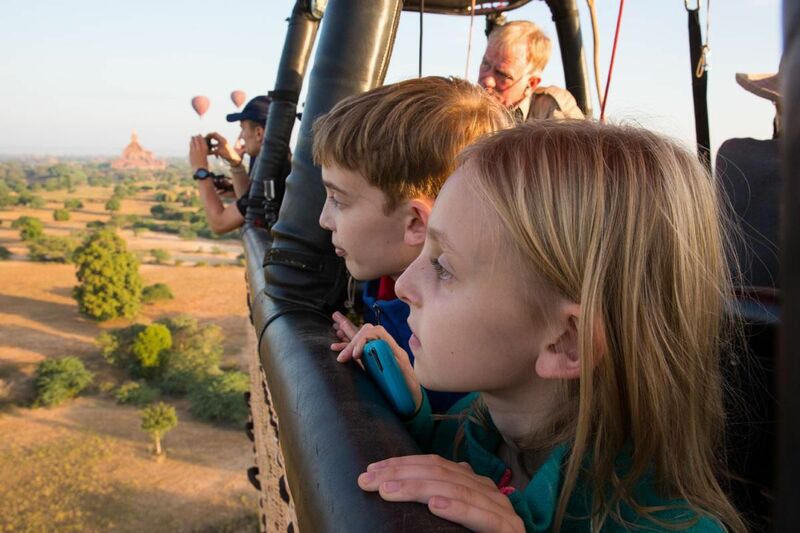 Tyler and Kara are older and taller now, making it much easier for them to look over the side of the basket to the scenery below. 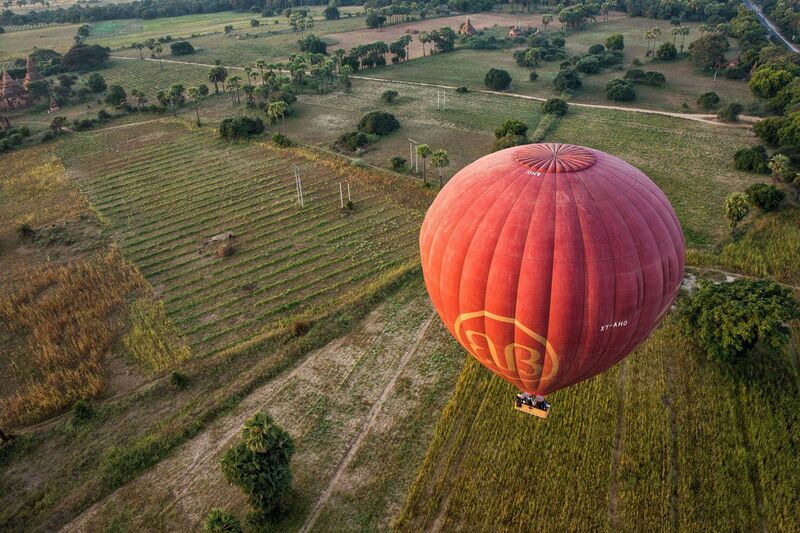 For forty-five minutes we floated over Bagan. Below us were over 2000 Buddhist and Hindu temples, farms of cotton and peanuts, and hundreds of palm trees. 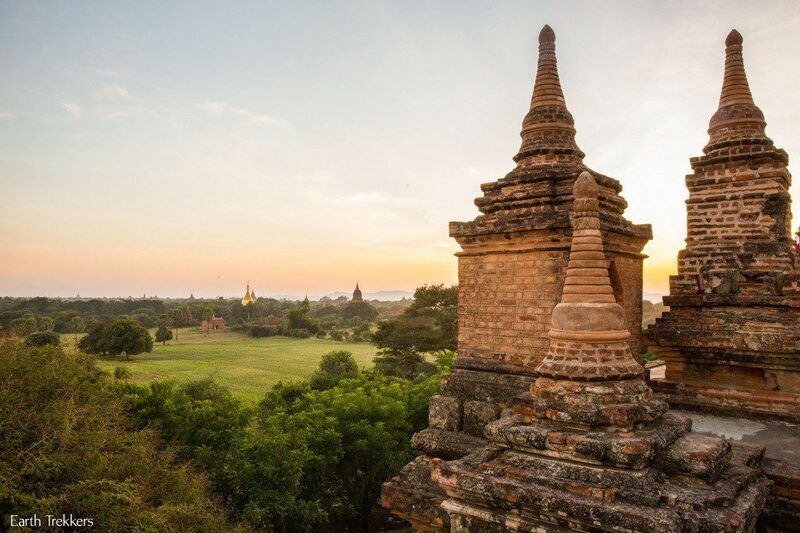 One of the best things to do while in Bagan is to watch the sunrise and the sunset over the temples. 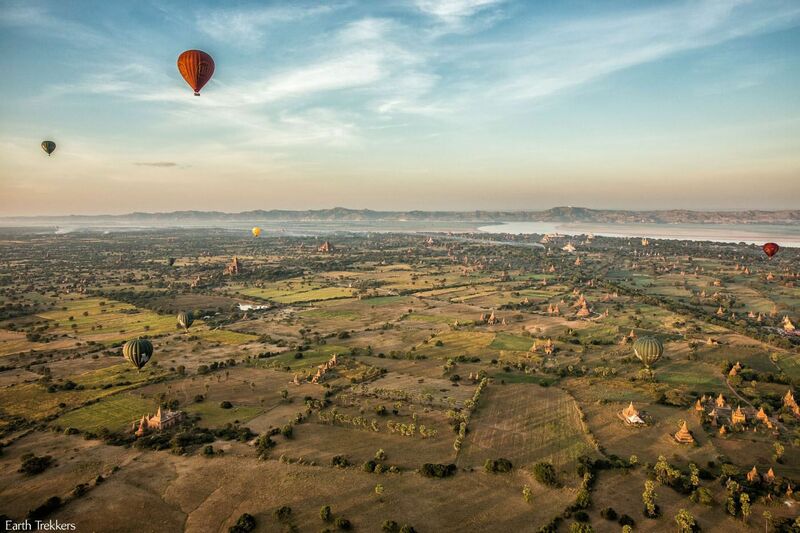 There is no better place to watch the sunrise than from a hot air balloon. 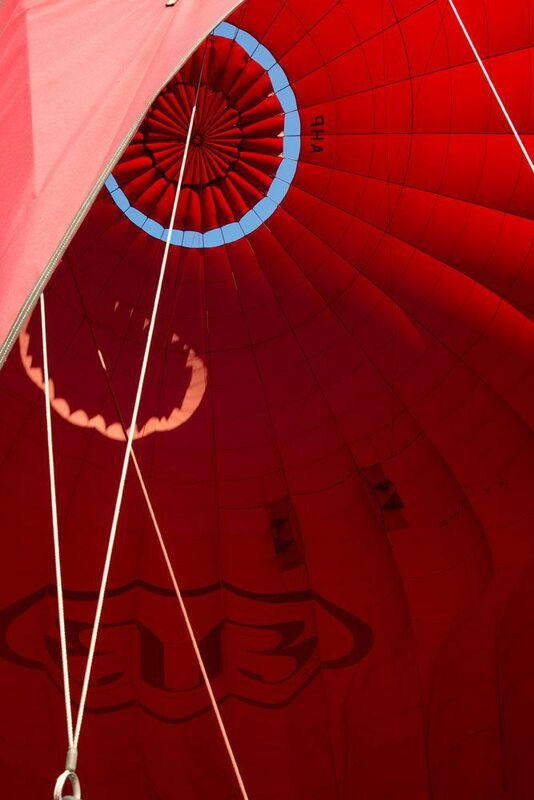 It was my Mom’s first time in a hot air balloon and she loved it! 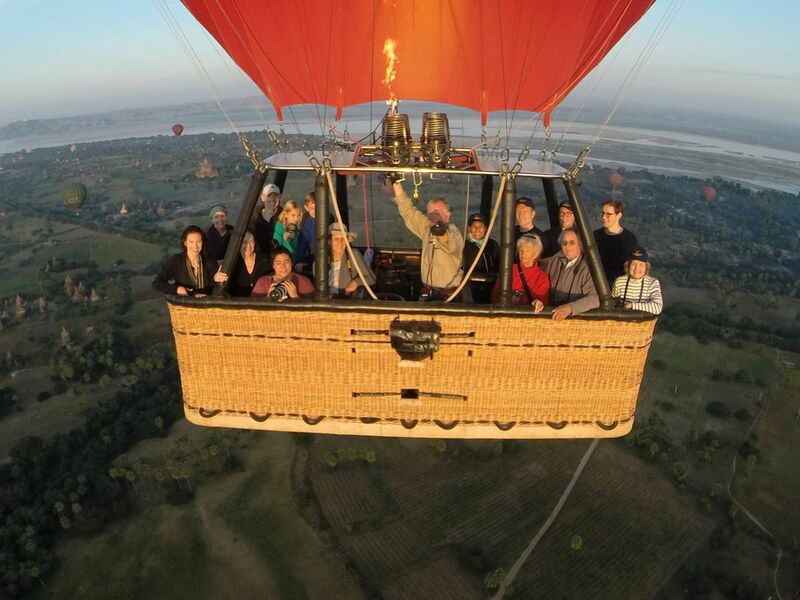 Balloons Over Bagan used a GoPro Camera to take a group photo of our basket. The Earth Trekkers are on the left side of the photo and my Mom is in the bottom right corner. The temples of Bagan are dedicated to different Buddhist and Hindu Gods, and without the help of a guide, it was hard to keep everything straight. 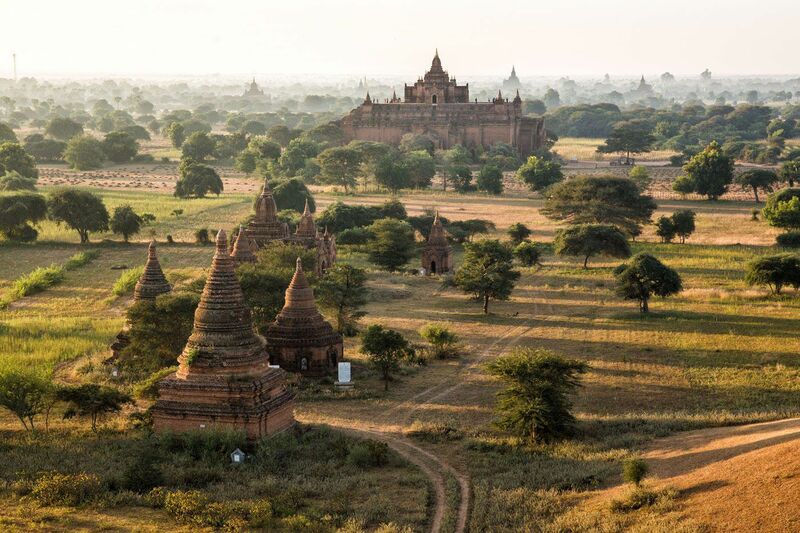 Our favorite part of visiting Bagan was seeing the horizon dotted with hundreds of temples in this tropical land. We landed in an abandoned field with the help of the ground crew. It was a smooth, uneventful landing. I think Tyler and Kara were hoping for some bumps and jolts to keep things exciting but no such luck today! Here is a shot of our landing zone and the crew awaiting us. 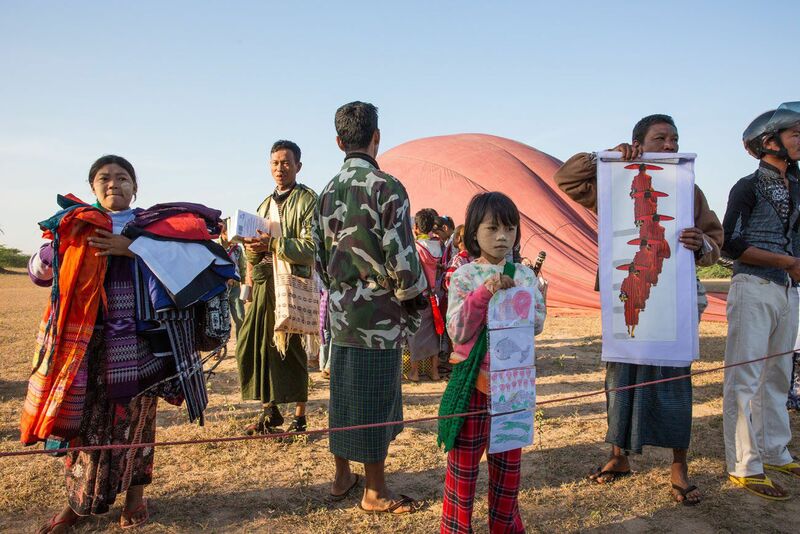 Once safely out of the balloon we were confronted with children and adults selling postcards, clothing, lacquerware, and other souvenirs. We were also treated to croissants and champagne. 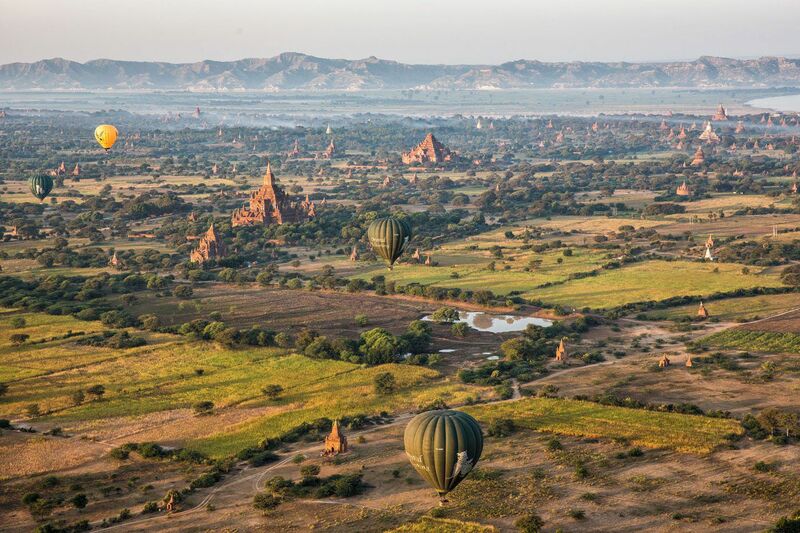 Viewing Bagan by hot air balloon was a splurge but it was totally worth it. 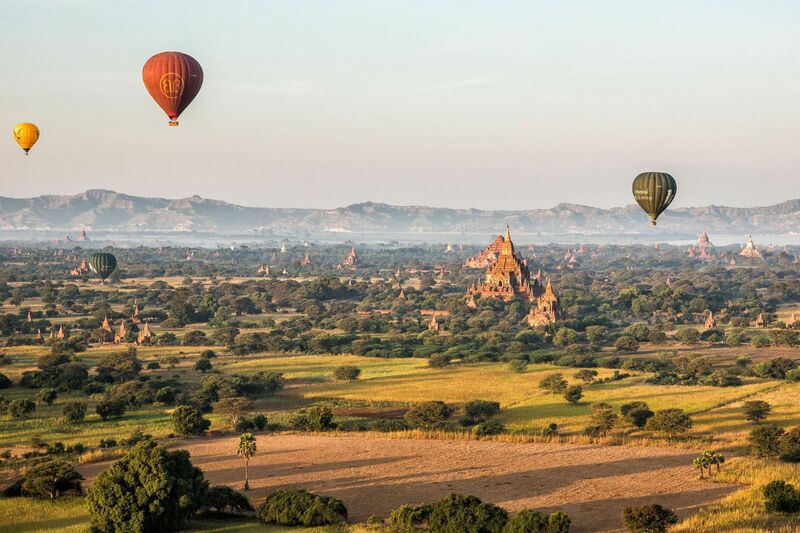 Bagan is a gorgeous area of Myanmar and one of the most unique places we have visited so far. 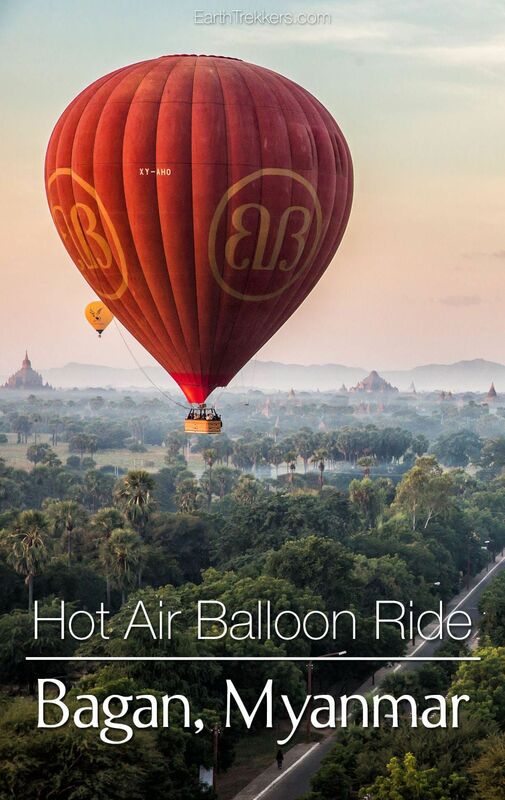 We booked our tour with Balloons Over Bagan (click here to visit their website). 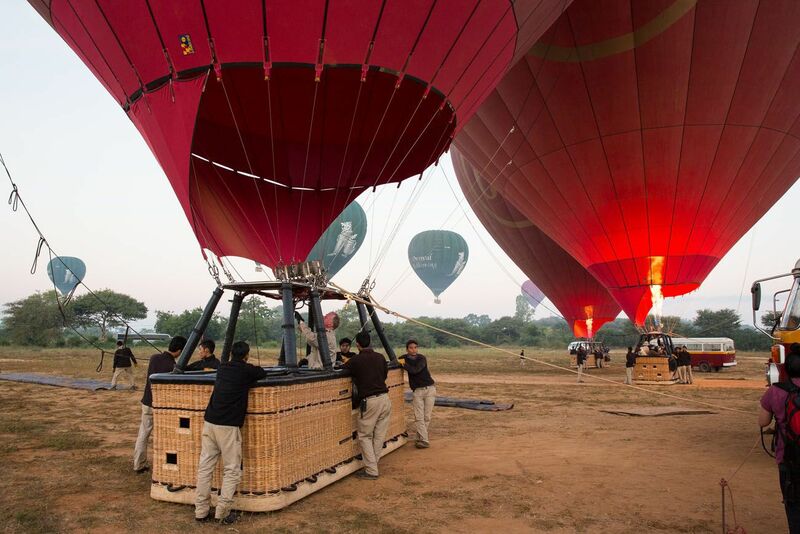 This is the oldest running balloon company in Bagan and until just one year ago they were the only game in town. As tourism picks up here, new companies are trying to get in on the action. Prices are high because there is not much competition yet, but I bet that will change in the years to come. 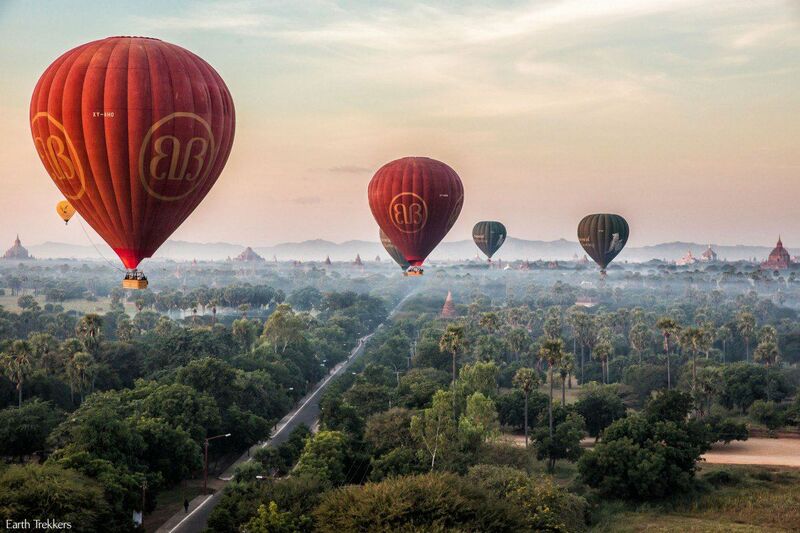 We were very pleased with Balloons Over Bagan. They run a very safe operation and from what we learned, their staff has a lot of experience. 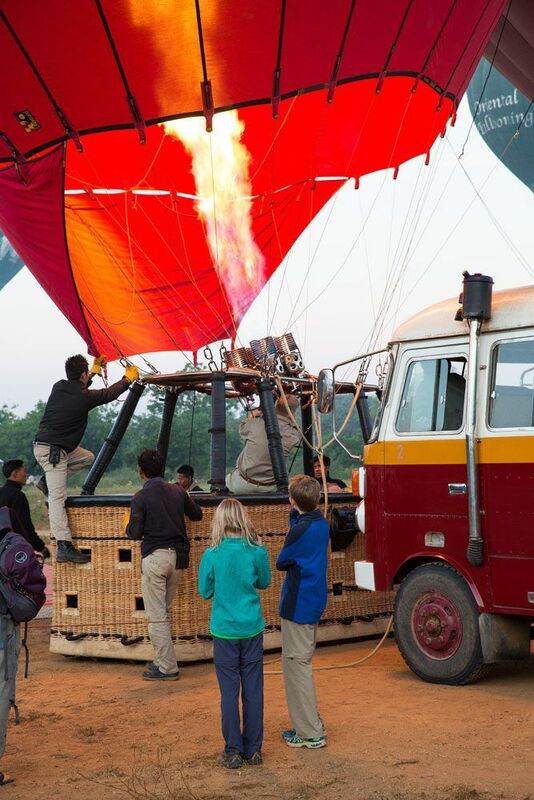 Our driver, Cary, is British and was one of the very first people to fly a balloon over Bagan. 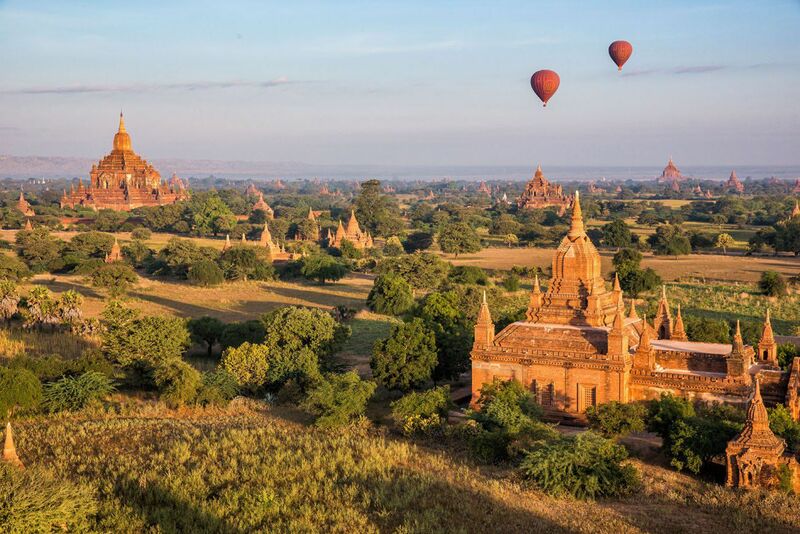 Slight discounts on the price are available through local tour agents but this fee will have to be paid in cash, either in US dollars or Myanmar kyat. During the peak season of December through February make sure you book your tickets in advance as seats sell out quickly. 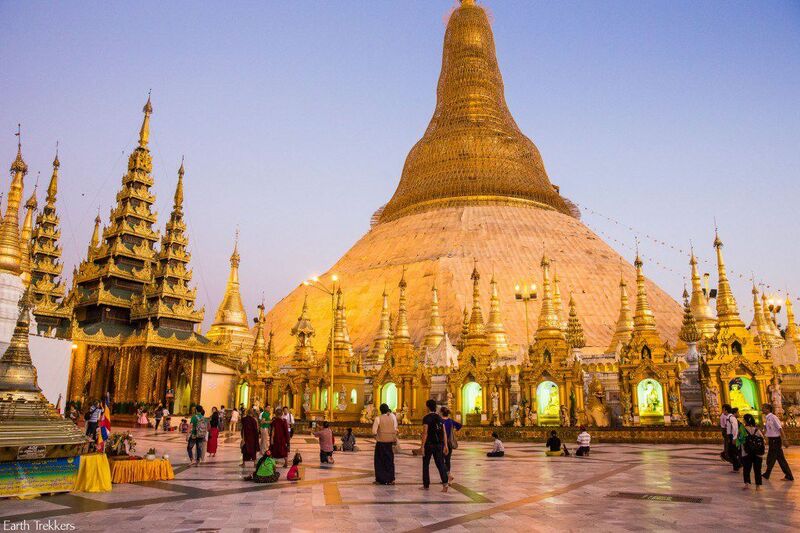 Are you planning a trip to Myanmar? Read all of our articles about Myanmar in our Myanmar Travel Guide. Loved this!!!! And the pictures .. Amazing!!!! Beautiful pictures. Like the one of Kara and Tyler looking out of the basket. Looks like lots of fun. Another form of transportation to add to your travels. 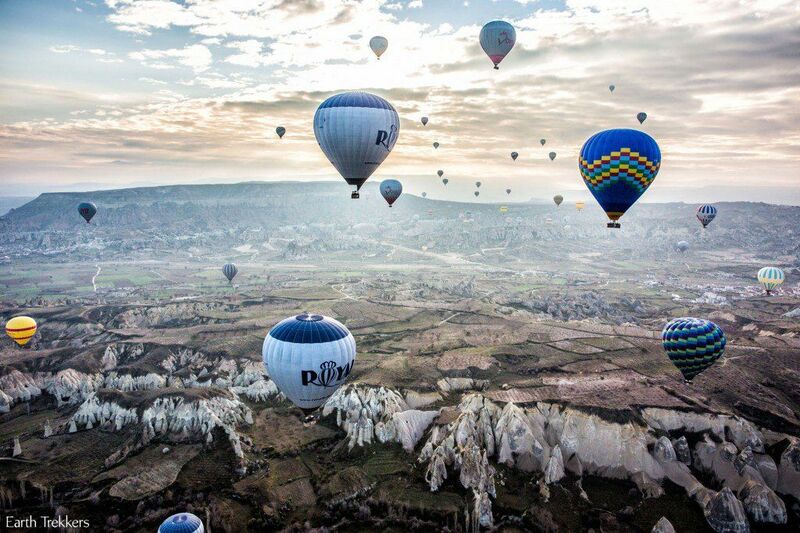 Always wanted to take a balloon ride. Kathy, this was your “elephant ride” from your trip to South Africa. I just can’t tell you how much I have enjoyed following your journey. I get excited each time a see a new post come in.